For the last year I have been working hard on completely rebuilding Rebrickable from scratch. I estimated it would take me a year, secretly thinking I could probably do it faster. Of course, I seriously underestimated the effort required. 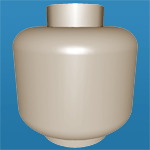 5 years of adding features and tweaking things on Rebrickable adds up to a significant amount of functionality that needed to be rebuilt. There were several times when I considered abandoning the attempt. I'm very happy (and exhausted) to finally announce it's here! A big thank you to all the testers over the last few weeks who submitted over a hundred bugs and suggestions for the beta site. Also huge thanks to the admin team who have been providing invaluable input and guideance over the last 6 months, and keeping the ship running while I've been pre-occupied! Over the following weeks, I will write some posts that highlight and describe some of the new features and changes in more detail. In the mean time, here is a high level summary. Have some fun with your account and show off how much of a LEGO fan you are! 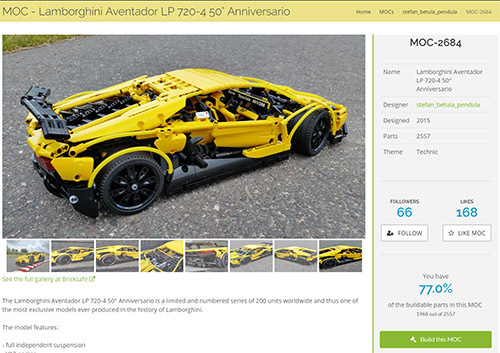 See estimates of what your LEGO collection is worth! There are far too many changes to list everything. Some of the other changes worth mentioning are below. The avatar images were cropped to square images during conversion. If your profile image does not look good anymore, please update it. MOC designers should review the descriptions on their MOCs. All HTML has been converted to BBCode, and if the source HTML had errors or was too complicated it may not have converted very well. Look for the Admin tab on your MOC's page to edit it. Designer Profiles and User Profiles have been merged. So if you have submitted public MOCs, you should check that your user profile has the correct URLs and display name. All old MOC URLs should redirect to the new ones so you should not need to update any external links pointing to Rebrickable. Check your settings - especialy security and notifications. Make sure your old settings converted across ok, plus there are plenty of new options available in v3 to set if you don't like the defaults. If you encounter any problems, please use the Forums to submit bug reports or find help from others. Despite the extensive testing undertaken, there are bound to be some issues on a project this large so please be patient while things get settled in :) I'm sure there will be more changes in the coming months as I continue to tweak and improve the experience for everyone. I know change can be hard, but I hope you all enjoy the new site as much as the old, and find it better than ever! I'm really new to the website, and never had the chance to see the old site. But wow, do I ever love this site! I recently pulled out our old lego collection and started to organize it for our daughter who's now recently a lego addict like her older brothers. Keep up the amazing work. Being a fellow web developer, I can only imagine the monumental tasks list you have before you. If you ever need an extra set of eyes for testing, I'm more than willing to help in any way I can or help contribute to the community. great job bro! but i can't edit my set&part with the new version, there's no response after clicking the button. is there something to do with the browser? l tried safari & chrome. Having logged into this site for the first time since the upgrade, I have to say I do like many of the new features. I found the estmated part value function particularly interesting. However, it seems that all the private MOC's I uploaded last year have completely vanished since the new Rebrickable was launched, and I can't find the option to submit a new private MOC either. As someone who solely uses Rebrickable to manage LDD builds in order to be able to order the parts needed for them and doesn't want to make the MOC's public, the option to submit a private MOC is vital to me. Is anyone else having this problem? Am I missing something? Is the private MOC option still there or can you only submit public MOC's which require approval now? Private MOCs have been renamed to Custom Lists. All your old data is still in there. I submitted a set months ago which and finally got a response, which was a rejection claiming it was "grossly inaccurate" (which was quite a shock, since I got it right of TLG's instructions). The email invited me to try and fix it and I would have loved to, but I no longer have that ability under the new points/levels caste system. Might want to look into a way to make the response more accurate and less demoralizing to aspiring contributors, because I'm quickly loosing interested in v3 and in contributing to this site. I think I just emailed you about this, but yes that's my fault sorry. I am working hard towards resolving all the problems people have with the new site. Please be patient, I am trying my best. The highlight for owned sets is kinda smallish, maybe can highlight the whole row instead, i.e. highlight the set number plus the "x2" behind it. This way it will be much easiler to spot the owned sets while scrolling the list up/down. After a week of working with V3: I love it! The admin-part of this site is greatly improved. Much more user-friendly and easier to keep a good overview. Especially adding spare parts is much easier and less error-sensitive. Great work on all the new functions! Thanks! I'm still dealing with thousands of error messages per day, but I'm slowly getting through them. Go to your set list and at the bottom of the set listing for the set you want to delete, there is a little notepad and pencil icon. That's for editing the set. Click on it and it will bring up the place where you can delete just that set. Thanks for all the hard work! Site looks great and I'm really happy with the 'mark as built' option. Can the link such as "rebrickable.com/designer/USERNAME"; (replace USERNAME with actual username) be reactivated or at the least have it redirect? I used it on my business cards that I made and just finished giving at last weekend's Lego convention and now I find it no longer works. I think it would help if the font was a bit darker against the white background. I have quite decent eye sight, but it's straining to read pages, especially with the light green against the white. Kudos for a huge undertaking. Keep up the great work. Huge undertaking you are doing, so I understand that tweaks will be needed to be made. It should be already, eg rebrickable.com/designer/Miro doesn't work for you? the color of the parts is not mentioned in words anymore! so I search the set I want to build or sort and now I can only see the color on the picture of the part ( if there is a picture available) but I really miss the color in words espescially when there is now picture of the part available but also with picture because for instand the difference of the black or dark gray parts are hardly visible on screen I really loved that in the previous layout please add the part color in words again! Many thanks to the develloper of this side! I love it! Nathan, thank you for your time and dedication ! Congratulations!! Thank you for your hard work. The entire community benefits from you and this site. Thank you for being willing to improve and not stay static. Big thumps up for the new site! Looks spiffing! Rebrickable should encourage users to leave their profiles public somehow. I collect spare parts and I want to see what others are collecting. OK, the first feedback from me: I cannot zoom this article by Ctrl+mouse_wheel. Instead of zooming it scrolls this page. Seems mouse wheel is somehow intercepted by some scripts. That's annoying. I really like the new design and the new features! So many thanks to all of you who made this happen! New rebrickable looks great, amazing actually. so many changes, so many improvements. huge amount of work everywhere. I just miss "hottest mocs" section on the top page. That is where I see the most interesting new MOCs. To me, that was the most important feature, now it is sort of missing, or there are only 4MOCs (recommended). Yes that's the idea, everyone has different preferences. 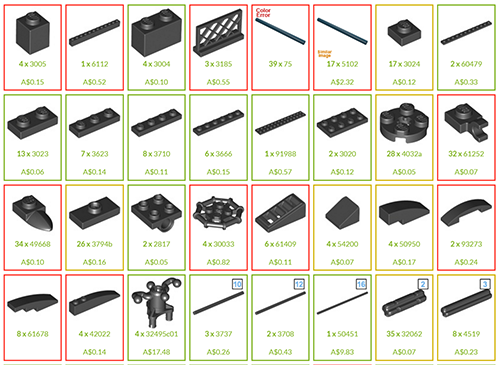 There is a lot I like about the new design, but easily adding bulk parts to a parts list is not one of them. If there is a way to add parts from the parts list page itself, it is not obvious. 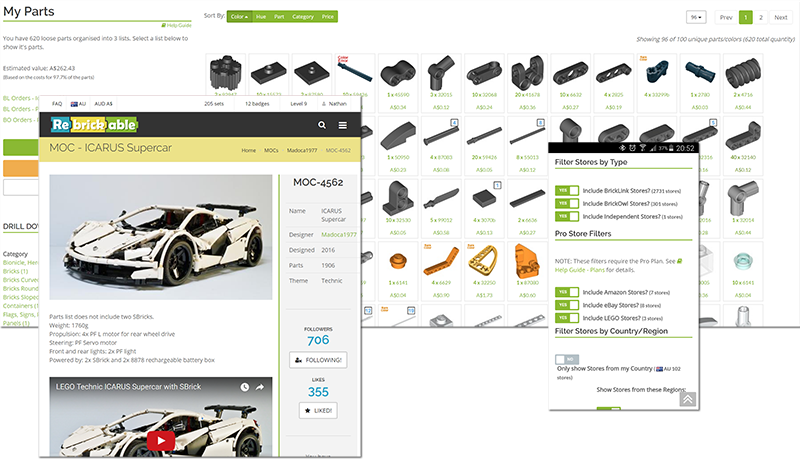 And adding parts by searching the parts requires constantly going back to the search page rather than just having the parts list on the search page like in the previous version. 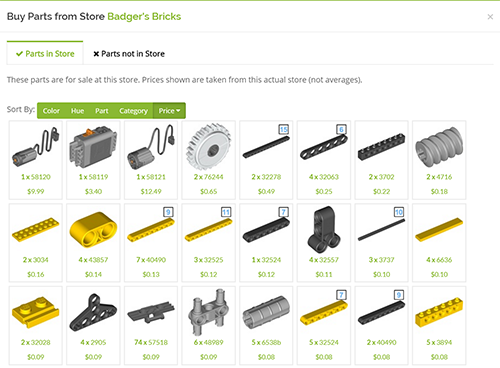 The buying parts list now very long, previously it only show a handful and can click to expand. Now I had to scroll all the way down just to move left/right to see more colour options of the part. When I list sets with say tile 1 x 2, the sorting previously starts from sets with largest number of that part, now it just sorts in largest set. How to change the sorting back to previous behavior? It doesn't make sense to show largest sets, instead should show sets with the largest quantity of that part I'm searching. thanks for this great website! if you could add the "mark as assembled" feature to my costume lists, the site would be perfect for me. Feels the older parts list layout better, also the collection statistic data and ranking is gone? Better stats will be added. The old stats/rankings were a bit broken. Congratulations!!! great job!!! I only miss the design number, where I can find it, please? Wow! This website is amazing! I've been here an hour just looking at the features! Thank you so much for making this site so awesome Nathan! Please , could you make the "my parts" inventory as before at least ? Extremely difficult to browse, the tabs with part and image type were much better. The update in general is not very bad , difficult to browse , specially on my laptop , the site looks to be optimized for mobile devices but not for PC - just IMHO. Would love to see v2 coming back , but I know that developers never come back , what is bad. PS there's an error , my comment instead of being edited was posted again as a new comment. There was a lengthy discussion of this already in the v3 Preview forum during beta testing. The Part Lists are different but further usability improvements will be made over time. Have you looked at your personalisation options? There are some wide screen settings which you might prefer.